New York - Plans to unveil an updated version of a new electronic system to officially record births and deaths within New York City in just under three months has an interfaith coalition of funeral directors and others who deal with burying the dead extremely uneasy based on the failure of a similar program that was rolled out last fall. The city’s Department of Health launched the new eVital program on October 9th 2017, suspending its existing EVERS system as eVital went live. But according to Yanky Meyer, founder and director of Misaskim, eVital was online for less than an hour before the DOH pulled it down to fix significant problems that arose immediately. The problems that ensued during those four days were tremendous, said Meyer. “Everything came to a screeching halt,” Meyer told VIN News. “People had to get paper death certificates written, except none of the hospitals actually had the paper certificates. Once those were finally written, people had to go downtown to get paper burial permits, with some standing on line for as long as five hours. After attending a training session last week for the new eVital system that is scheduled to go live on October 1st, Meyer said it seemed like history was about to repeat itself. According to Meyer, eVital has not been tested by funeral homes and other end users and DOH statistics show that of the 13,992 doctors affiliated with hospitals who had been enrolled in EVERS, only 5,353 are currently registered in eVital, which would leave the remaining 8,639 unable to file death certificates, a necessary step in the burial process. Other problems include a facial recognition system that will take time to recognize users if they change their appearance by growing or shaving their facial hair or by altering their hairstyle, and a queueing system that will automatically hold all requests for an hour before they are processed. EVERS will be taken down by the DOH on the Friday night of Chol Hamoed Succos, with eVital scheduled to launch 48 hours later on the night of Shemini Atzeres, a scenario that could potentially postpone Jewish burials for as long as four days. 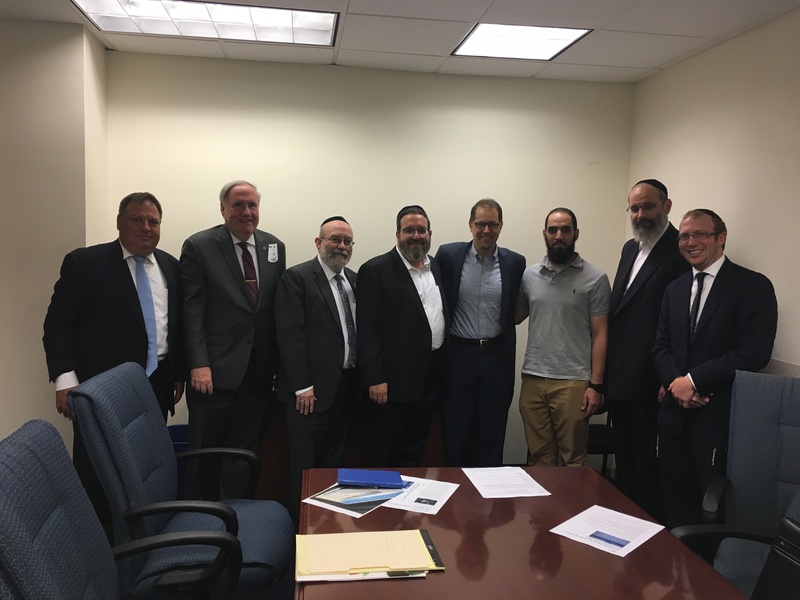 Hoping to have the DOH postpone the rollout of eVital until all doctors and funeral homes are on board and the system is properly tested, Meyer put together a broad coalition that includes members of the Jewish, Muslim and Catholic communities as well as funeral directors from all across New York City. The group, which included James Blair of Blair Funeral Home Services, John Golden, president of Metropolitan Funeral Directors Association, Meyer, Andrew Parver, director of operations of the Hebrew Burial Society, Noor Rabah, founder and CEO of Muslim Funeral Services, Meir Weill of Misaskim and Rabbi Elchonon Zohn, president of the National Association of Chevra Kadisha, met with City Councilman Mark Levine on Monday. In an interview with VIN News, Levine said that he intends to do everything in his power to make sure that no disruptions take place in the process that issues death certificates. Levine categorized the scheduling of the rollout on Succos, as “ill timed” and said that it will likely create unwarranted hardships for grieving families. Rabah called on the DOH to delay the launch of eVital launch until all of the problems have been identified and resolved and even then, only with a reliable backup plan in place. City Councilman Chaim Deutsch said that he will be meeting with Meyer to discuss the subject on Thursday and that he looks forward to seeing the issue successfully addressed. Representatives of the DOH were not immediately available to comment on the matter. Government software designed by the lowest bidder / highest briber, supervised by communist idiots in govt. Some years ago, I was involved with a city agency with similar problems. The honchos at the agency understood little about computer systems and how they work. At a meeting I listened to them describe how they want to implement a new system within a short time. These honchos had little understanding of systems and were making plans for the system that would assure that it would fail, but wouldn't listen to anyone at the meeting with actual computer knowledge. It soon became obvious that this was a disaster. It would take eight more years to get the new system working.